The boys all gathered together at The Pelican Club for a luncheon of fish and good fellowship. And when their confab was finally concluded, they lingered for most of the afternoon, unable to concur as to who would pick up the tab, until it was generally agree that they would all ask for separate bills. Oh my! Impressive! One day I'll see a white pelican. @seattlite Thank you. Glad you like it. @koalagardens That's just because "Enquiring minds want to know!" @Dawn I think that's because we're so close to Hollywood. 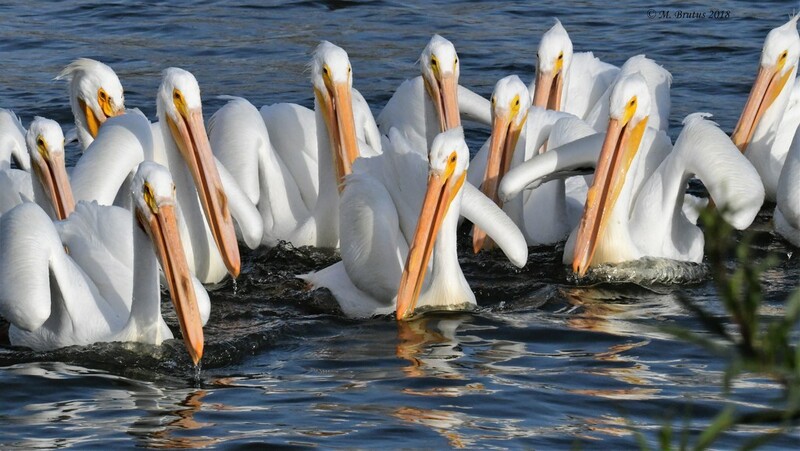 @mbrutus Groups of pelicans have a lot of cool names, “brief”, “pod”, “pouch”, “scoop” and “squadron”! So fun! @louannwarren I recently found out for a poem that I am writing that a herd of giraffes is called a tower. @kork Thanks for visiting and commenting. Fav. Fabulous shot and your commentary made me smile. Haha! There is that wit. Fav. What great focusing on these pelicans. I've missed your commentaries - this one is as good as your shot. We have a group of about 50 still below the dam - they are entertaining to watch. Such fun! Like posing for a class photo! They look as if they've been cloned or sprayed with "Liquid Paper." There is a melody in the way they are lined up. They look like a team of players posing for a picture. Did you tell them to say "cheese" or perhaps something you won't share with us because it's proprietary.